« San Onofre Nuclear Plant Closing: A harbinger of things to come for the U.S.’s aging nuclear fleet? MidAmerican Energy has scrapped plans for Iowa’s second nuclear plant and will refund $8.8 million ratepayers paid for a now-finished feasibility study, utility officials said Monday. The utility has decided against building any major power plant. That’s because there is no approved design for the modular nuclear plant it envisioned, and there are too many questions about limits on carbon emissions from a natural gas plant, the company said. "We opted for what was in the best interest of our customers," MidAmerican vice president for regulatory affairs Dean Crist told The Des Moines Register. The decision ends, for now, a three-year controversy over the future of nuclear energy in Iowa and how to pay for a possible nuclear plant. Iowa has one nuclear power plant, the Duane Arnold plant near Palo. Crist said a feasibility study started in 2010 found that two 700-acre sites near Thurman in southwest Iowa and Wilton in southeast Iowa would work for a modular nuclear plant, which was expected to cost around $1 billion and to be built in phases. The MidAmerican study, finished several months early, also noted that the type of modular nuclear plant envisioned could be cost-effective, would be safer than earlier plants and would be a $135 million annual boon to the Iowa economy for 40 to 60 years. In addition, the 11-year construction would bring another $1.2 billion in spending, a peak of $75 million in payroll, and 1,880 jobs. But MidAmerican said those modular plants have not been designed and approved yet. And carbon regulations continue to make fossil-fuel plants a tougher proposition, Crist said. Muscatine County Supervisor Scott Sauer said he had opposed any power plant at the Wilton-area site, preferring that the utility build on the sites of decommissioned coal plants instead. James Larew, an Iowa City lawyer, had been critical of MidAmerican’s financial proposal for the plant because ratepayers, rather than investors, would have borne the risk. He credited AARP and other organizations for killing the legislation. MidAmerican became part of a national wave of nuclear plant proposals in the United States, which last year approved its first new reactors since 1978. More than 100 proposals turned up as utilities looked for ways to sidestep almost certain limits on carbon emissions linked to climate change and largely from coal and natural gas. Plans softened after earthquakes and tsunamis caused the Fukushima nuclear disaster in Japan in March 2011. Now, with natural gas cheaper and plentiful, there is more talk about gas plants, and less about nuclear. Mike Crecelius, Fremont County emergency management director, said he wasn’t surprised by MidAmerican’s move. One of the sites was in the county, and there has been widespread, unfounded concerns about groundwater contamination, he said. The Japan disaster didn’t help MidAmerican’s plan, said Crecelius, but he noted that the Iowa plant would have used modular designs that would use far more modern technology. Iowa environmental groups that had objected to MidAmerican’s attempt to charge ratepayers in advance for the nuclear plant praised the move to scrap the project. "Yay!" exclaimed Neila Seaman, director of the Iowa Chapter of Sierra Club. "We are glad to hear that they are planning to expand their wind power. We think that is a better option than nuclear power," Seaman said. "Nuclear power is dangerous and then there is the waste issue," Seaman added. "It is expensive and we just think there are better options." Others saw it as a victory for clean energy. "I think our perspective is that the right mix of clean energy, whether wind energy, or conservation, or both, can meet Iowa’s demand for energy," said Nathaniel Baer, who follows energy issues for the nonprofit Iowa Environmental Council. "This is welcome news." The lack of an approved design for the new plants is another major reason few reactors are expected to be built in the next decade. MidAmerican will ask the Iowa Utilities Board to approve a refund and cancel on July 1 the special charge ratepayers paid for the study. The utility collected $14.2 million over several years, and it will return the $8.8 million it didn’t spend on the site and market analysis, tests, and the like. The money would be refunded over a year, beginning in August. MidAmerican plans to let its land options expire, and will sell a couple of Muscatine County properties it bought for soil tests. Crist said it probably will be toward the end of this decade before the utility takes another hard look at a major power plant project. In the meantime, Mid­American will focus on its plan to build up to 656 wind turbines in a $1.9 billion project across Iowa, which also will trim power bills by saving fuel costs. Ratepayers will see a slight dip in bills because of the nuclear-study refund, Crist noted. MidAmerican President William Fehrman has a background in nuclear energy. Over several years, he suggested the nuclear facility was the best choice for a major plant needed for Iowa’s economic growth, as well as to replace power from coal plants that would be mothballed as federal regulations limiting carbon emissions ramp up. But a controversial bill MidAmerican backed in the Iowa Legislature led to a political brouhaha. On Monday, Crist said that fight didn’t doom the plant, noting that Mid­American could have petitioned the utilities board to allow the financing. The legislation would have allowed MidAmerican to charge customers for planning and construction of the plant before it was built, and even if it wasn’t, to a point. In February 2012, an Iowa Poll found that 77 percent of Iowans polled opposed the arrangement allowing the utility to charge customers up front for the planning and construction. Eighteen percent favored the approach. 2010: Iowa Legislature passes a bill allowing MidAmerican to recover up to $15 million to pay for the feasibility study on the nuclear plant. Gov. Chet Culver signs the bill. MidAmerican eyes $1 billion plant project. 2011: MidAmerican donates $70,000 to a political committee with ties to Senate Majority Leader Michael Gronstal and $20,000 to Gov. Terry Branstad’s committee. MidAmerican’s committees also donated $250 or more to dozens of state legislators from both parties seeking re-election last year. MARCH 2011: Fukushima nuclear disaster in Japan draws huge debate over future of nuclear power. FEBRUARY 2012: In an Iowa Poll, 77 percent of Iowans opposed MidAmerican’s proposal to charge customers in advance for the planning and construction of the nuclear plant. SEPTEMBER 2012: MidAmerican meets with landowners and residents in Fremont and Muscatine counties in invitation-only sessions. OCTOBER 2012: MidAmerican gets approval for rate increase to offset a drop in its rate of return and to cover spending on environmental compliance and coal transportation. 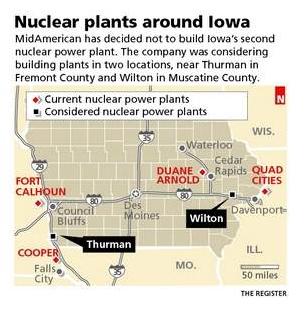 JUNE 2013: MidAmerican announces it won’t proceed with developing any power plant, nuclear or gas.